FILE PHOTO: Soldiers guard outside the ‘brick prison’ at the Georgetown Prison, Camp Street. A convict, who was found in an semi-conscious condition in a cell at the Georgetown Prison along with three other prisoners, died on Sunday at the Georgetown Hospital. Acting Director of Prisons Kevin Pilgrim said Shawn Thom had been placed in a cell with three other prisoners after he had stabbed another inmate on May 25, 2018. He said Thom had been discovered in a semi-conscious state in the cell on May 26, 2018. Up to the time of his death, Thom had been serving two three-year consecutive sentences for unlawful possession of firearm and unlawful possession of ammunition. The Acting Director of Prisons said police were investigating both matters- Thom’s stabbing of the prisoner and his discovery in a semi-conscious condition. The Prison official said he was unaware of any allegation that at least two prison officers had rewarded the three other prisoners with cigarettes to injure Thom in the cell. “If any reports of that nature would have come out, it would have been brought to the police attention, but as it relates to me receiving such, I didn’t,” Pilgrim said. Meanwhile, prisoners at the Georgetown Prison were on Sunday restive, with Pilgrim saying there was an “ongoing feud” that was triggered by inmates throwing water on others through a vent. He said that escalated into tension with a number of the prisoners breaking several beds to arm themselves against each other. 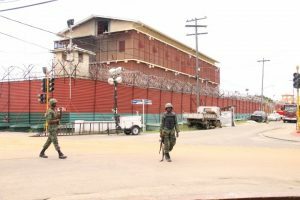 Guyana’s biggest prison unrest occurred on July 10, 2017 when the Georgetown Prison was destroyed by fire. None of the almost 1,000 inmates at the time had been injured or killed , but several of them had escaped and eventually recaptured.